This delectable dish is taste-tempting, beautifully arranged, and filling. If friends are coming over for dinner, this is a dish to fill a crowd. It is also an excellent choice for a busy weeknight and a healthy combination of meat, vegetables, and condiments. Cumin and paprika make it slightly different from classic recipes and it is delicious, nutritious, and flavorful. Our kids love pulled pork, and this is an easy way to make them happy. 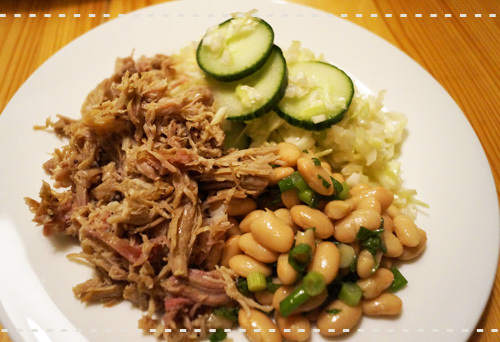 And combining pulled pork with cabbage and bean salad creates a beautiful, tasty, and exceptional dish. Remove twine or netting from the pork. Combine onion and garlic powder, black pepper, salt, paprika, dried thyme and cumin seed and add vinegar and olive oil to make a paste. Use a slow cooker, add pork, and top with the olive oil and vinegar paste. Cover with a lid and cook on low for 6 1/2 hours or until the meat shreds easily. Use a fork to check. Use a small bowl to combine olive oil, salt, and vinegar. Add the dressing to the cabbage and cucumber and garnish with green onion. Set aside. Combine green onion and kidney beans in a bowl. Instead of kidney beans, you can use garbanzo or black beans. Use a separate bowl to whisk vinegar, lemon juice, and olive oil. Season with freshly ground pepper and salt. Combine well and pour the dressing over the salad mixture. Stir all ingredients to coat. Shred the cooked pork using 2 forks and distribute on 6 plates and serve meat with the cabbage and bean salad.